This is the famous WS19 used in numerous soft skinned and armoured vehicles from 1941. 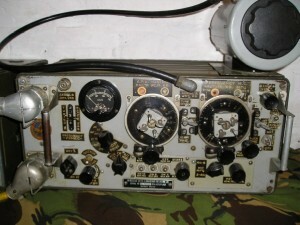 The Transceiver “A” set covers 2.0-8 MHz with a output of about 2.5 watts AM &. 5W on CW. There was also a VHF FM “B” set covering 229-241MHz with 400mW output for short range use and an Intercom for crew communications. 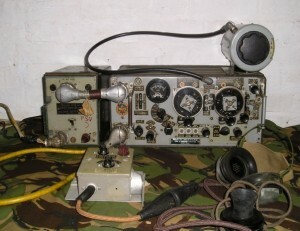 The pictured shows the Canadian MkIII version with Cyrillic legends. These were manufactured by RCA and other companies, as part of the lend-lease scheme for allied Russian forces. The B sets were often removed during workshop refurbishment after WWII. Members, please look at the BLOG (Under the NEWS Tab). The current sale of radio equipment ends on 25th April. All proceeds to SARS funds. Our weekly Wednesday lunch at Cafe Continental, often followed by a trip to the Beachy Head Radio Site. G8DXU will not be available on this occasion. Possible practical session for the Foundation Exam candidates. The 50MHz contest is tomorrow when there will probably be more members on site. First 50MHz contest of the year 0900-1200 UTC (1000-1300 local time) at our Beachy Head Site. We will be running a new Linear Amplifier with 400 Watts of RF into our 5 element beam. This will help G1KAR/P compete with other high power contest stations and give us more chance when working dx stations! Barry G8DXU will unfortunately not be available due to other commitments. G8DXU will be on site from 1100 with the session starting shortly afterwards. We can try some mock papers and follow this with a question and answer session. It is acknowledged that some members may not be available until the afternoon. The session can be extended to 1800 or so depending upon student requirements and availability.. Regrettable G8DXU is again not available due to other commitments. Nothing planned for this date due to exams at Polegate starting at 1630 for Intermediate and 1830 for Foundation. From Time 1600 Local for Invigilators. More about Intermediate Exam at Polegate. Amateur radio stations around the UK are invited to participate in this event to promote the work of the RNLI. SARS may participate subject to there being sufficient interest from members..
G8DXU is not available on this occasion. Copyright © 2019 Southdown Amateur Radio Society All Rights Reserved.